Sometimes a permit applicant will be required to gather community feedback as part of an approval or permit process. We created the "Survey Step" type to allow for the inclusion of feedback or information from people who are not the applicant, the process administrator, or reviewers. For example, neighbors who have to consent to close their street for a proposed block party, employees who must report their commuting habits for Transportation Demand Management processes, or community members who are able to provide input on a proposed park, mural, or development proposal. The Survey step lets you create a survey and a publicly accessible link that can be distributed to specific survey participants or the larger community, Then responses to the survey can be aggregated and included in the process, and all the results are always linked to the specific application or submission. 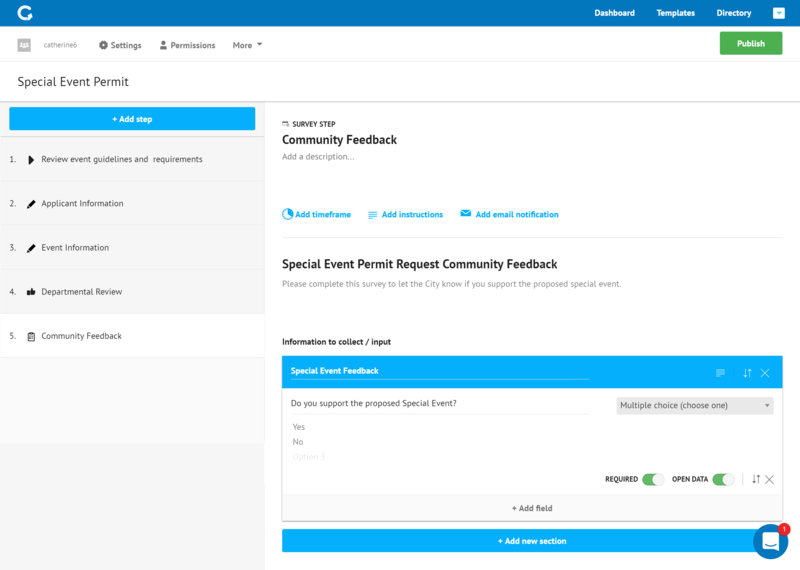 For example, if there are 10 different people applying to host block parties during the coming month, and they've each started a process, there will be 10 different links and survey results will automatically be linked to a specific proposed block party process. We're in the process of expanding the capacity of the survey step, so please provide any feedback on it through our chat function.